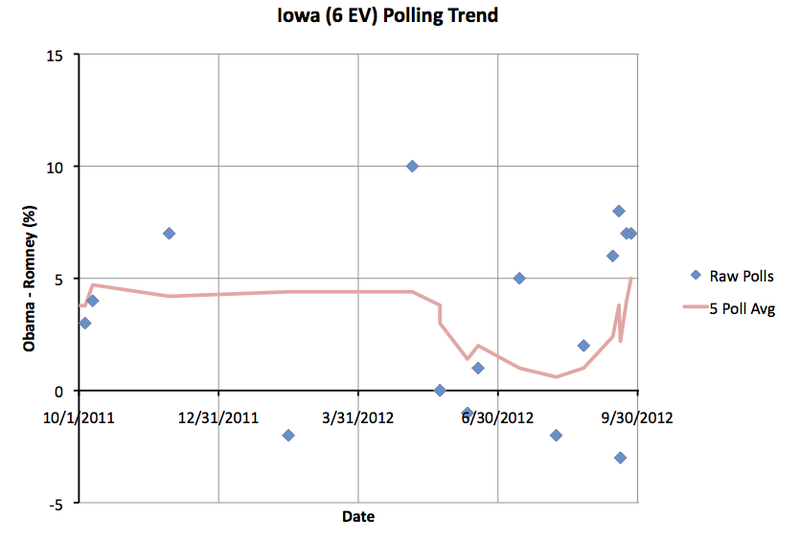 First up, Iowa, with six electoral votes. 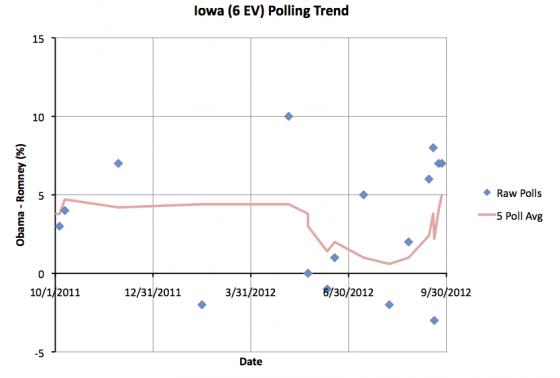 A new poll came in “out of order” which erases yesterday’s peak that got Iowa to a 5% Obama lead. The chart above looks at the five poll average as of the end dates of each poll given all polls known today. 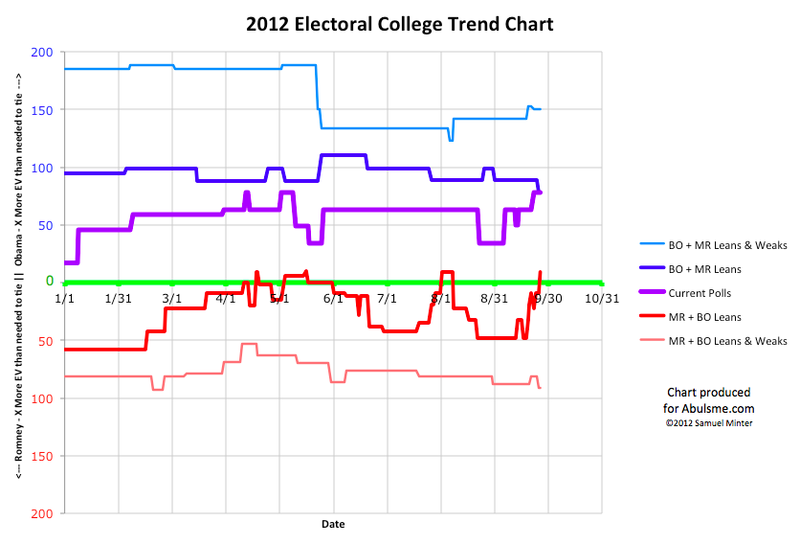 The trend chart at the top of this post shows the state of the race as of what was known on each day. * So even though the peak gets erased on the state trend, it still shows up for that one day on the summary chart since as of yesterday that was the best estimate. A bit confusing, sorry about that. In any case, Iowa now drops back into being a competitive state. Obama now has a 3.6% lead… Romney coming back and winning the state seems very possible. 3.6% is not a big lead. 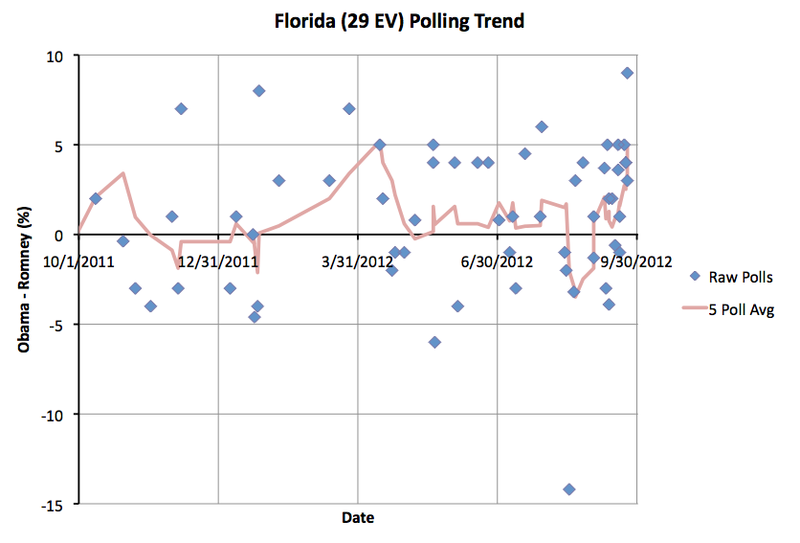 Two of the last five polls in the state actually show Romney ahead in the state. 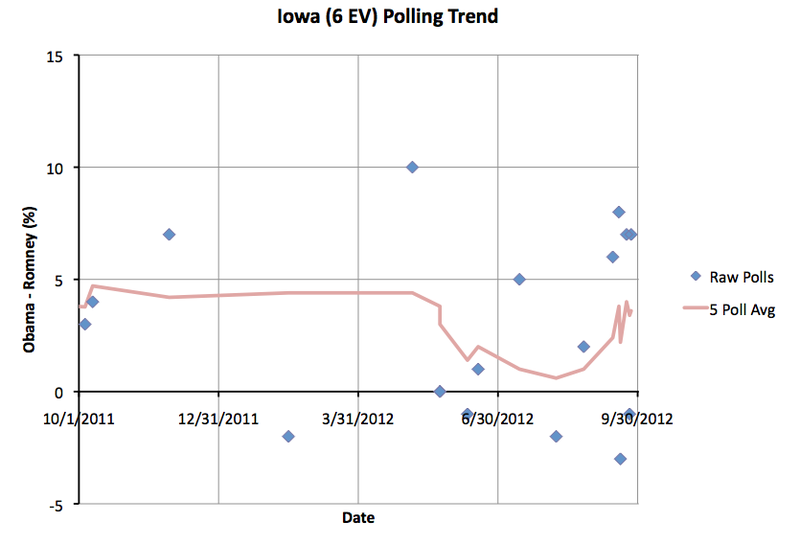 The five poll average has never shown Romney ahead here, but Iowa once again goes into the “close state” pool. Romney winning the state is quite possible. Next is Virginia with 13 electoral votes. 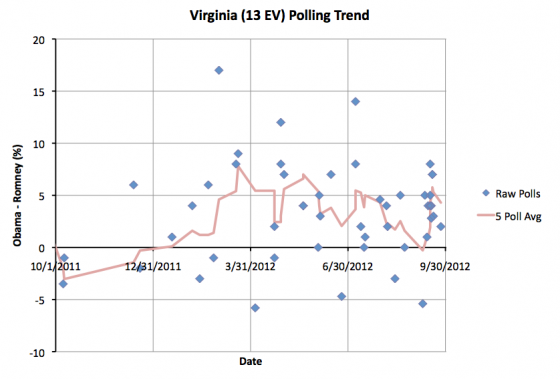 On September 23rd Obama’s five poll average lead in Virginia topped 5%. Today he dips back below that threshold. 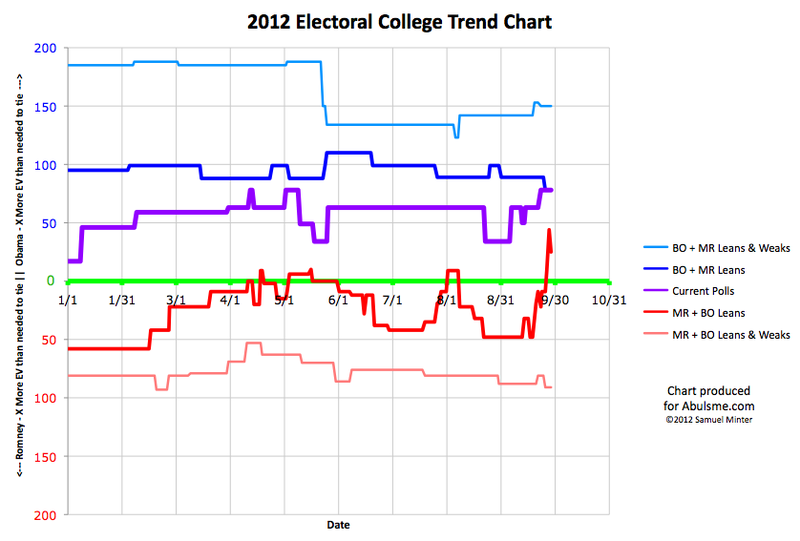 Obama’s lead now stands at 4.3%. 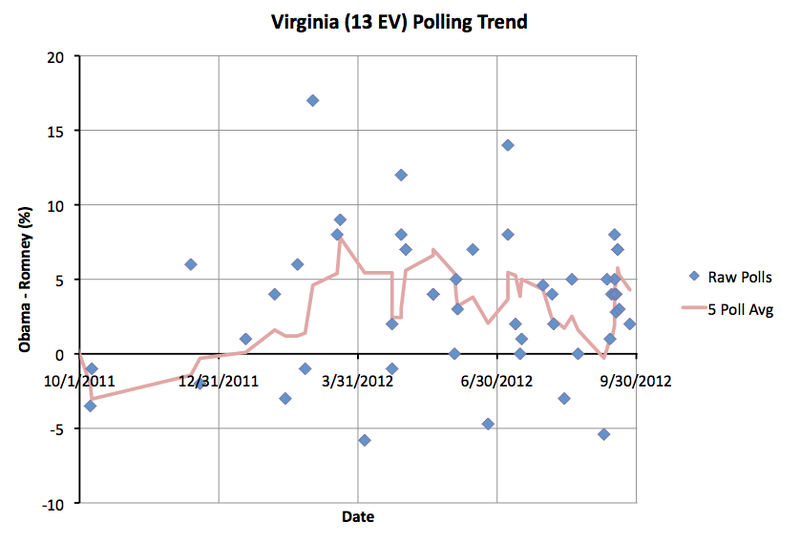 Virginia has bounced around quite a bit over the past few months. 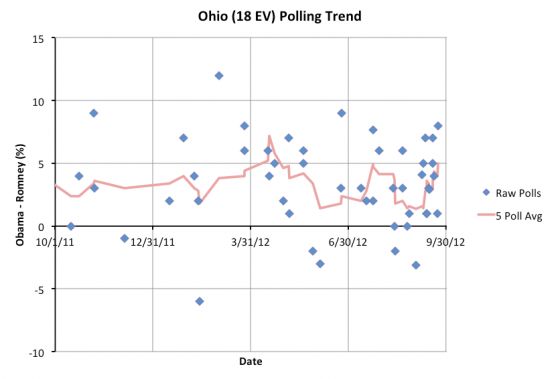 In the last three months it has ranged from a 5.8% Obama lead to a 0.3% Romney lead. 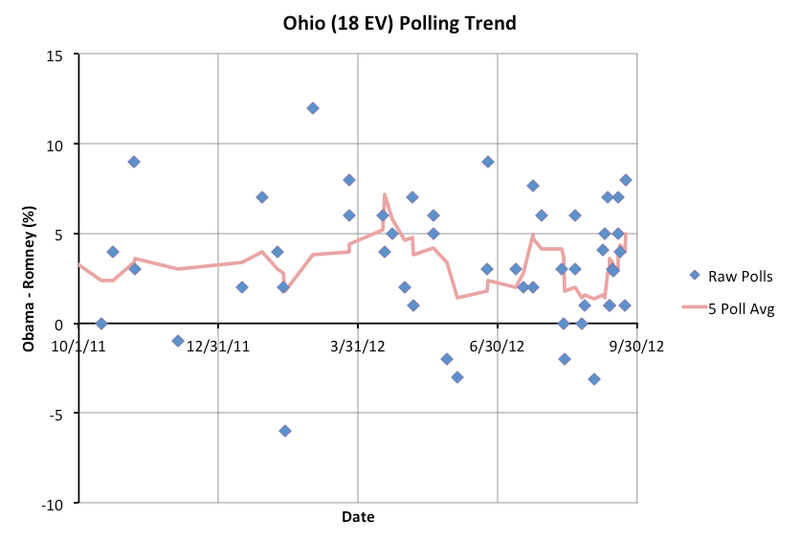 Most frequently the state has shown an Obama lead, but a small one that could easily disappear. 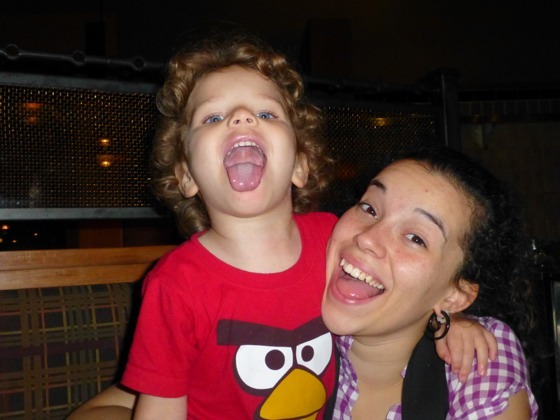 Virginia is once again in that situation. 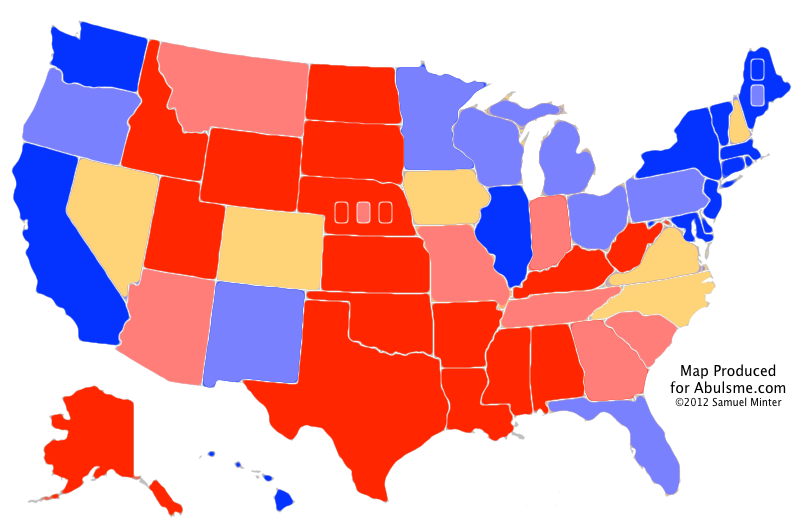 Romney’s best case is still to lose, but if he wins all the close states it will not be quite as bad a loss now that Virginia and Iowa look like they may be in play again. 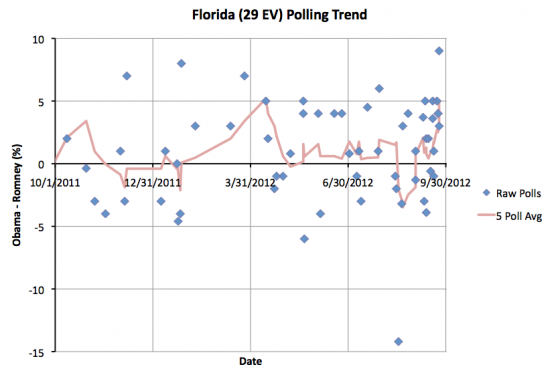 Is this the beginning of a more general move back toward Romney? It is obviously too early to tell. But it is not unreasonable to think that while Romney had a few bad weeks, if he manages to avoid any more major missteps, people who reacted negatively recently may start to come back to him. We’ll see how big this move over the next few days. 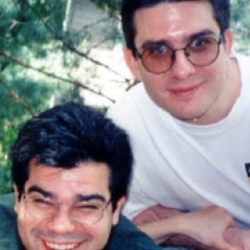 After that, we start seeing what effect, if any, come out of the Presidential debates. 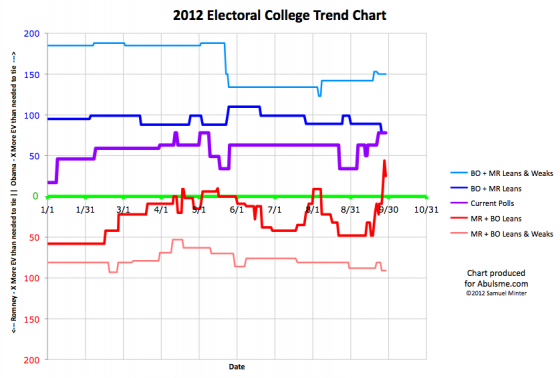 * The exception is when an old poll comes in so late that is is not within the five poll average at all. If that happens, and if it changes the trend lines, I will retroactively adjust the historical trends. But if polls come in “out of order” but still within the “last five” they are considered a current poll and are just added in normally with no retroactive adjustments.